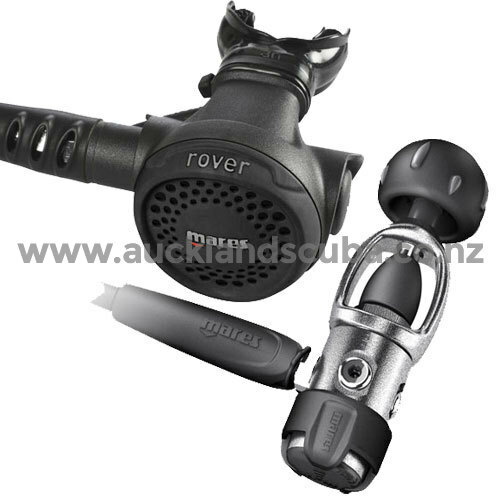 The new Rover 2S is an excellent choice for intensive rental use in the Diving Centers and for all divers who want reliability! The new R2S first stage is the evolution of the piston regulator. The first stage is made of marine grade brass with a sandblasted finish for increase scratch resistance. The protection cover of the first stage is designed to allow the installation of an optional RFID chip for rental use managed by dedicated PC software. The lightweight compact and sturdy non-balanced first stage piston design with its Dynamic Flow Control (DFC) system minimizes the intermediate pressure drop during inhalation, making it possible to use a simpler and more reliable second stage regulator further increasing reliability. The DFC does not require any type of manual adjustment for the second stage due to the consistency of the stable air flow, even under extreme conditions. The Mid-Sized Techno-Polymer second stage regulator with its simple, yet reliable downstream demand valve design has a Fluid Dynamic Deflector. This innovative deflector, developed after in-depth studies and tests of fluid dynamics, is engineered to receive and properly direct the airflow from the bypass tube to the mouthpiece. Combined with the Vortex Assisted Design (VAD) system that creates a swirling vortex with a low pressure area in the center of the regulator that keeps the diagram down during inhalation, for very sensitive and easy breathing at all depths. Mares patented Mesh Grid design of the second stage cover reduces the pressure of water flowing onto the second stage diaphragm and minimizes free-flow. Even in strong currents it eliminates the need for a knob to de-tune (make it harder to breathe) your air delivery system to stop the un-wanted free-flow: advanced technology through basic physics. This simple and reliable design makes for easy and reduced maintenance. First stage has one high pressure port and four low pressure ports. Rover 2S has a 3/8" threaded 31.5" (80 cm) hose.